Nokian Tyres has developed the most energy efficient winter tyre model in the automotive industry. The new Nokian Hakkapeliitta R2 is a genuine winter tyre designed for BMW's unique i3 electric car, and it combines extremely low rolling resistance, first-class grip, and exceptional driving comfort. According to tests, the Nokian Hakkapeliitta R2 can reduce the rolling resistance of electric vehicles even 30%. The energy savings gained from the lower rolling resistance increase the vehicle's range. In January 2015, the world's northernmost winter tyre manufacturer is introducing a winter product that achieves the A class in the European tyre label. 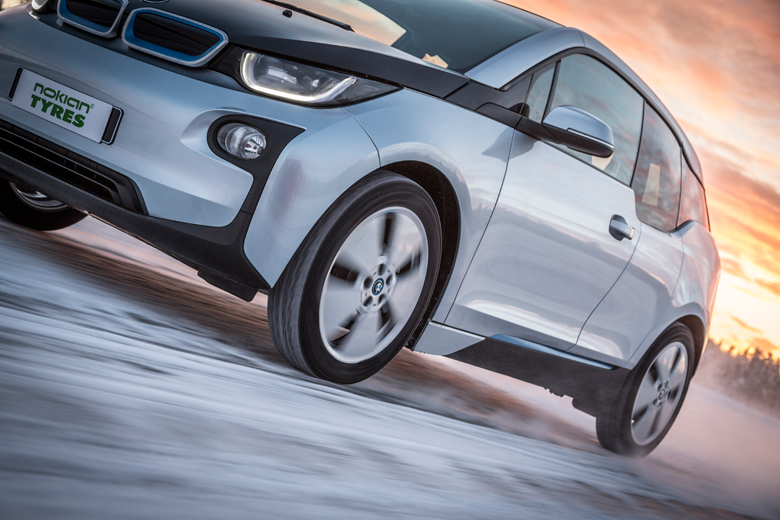 The new Nordic non-studded Nokian Hakkapeliitta R2 winter tyre is especially designed for BMW's i3 electric cars. The new tyre model’s size is155/70R19 84Q. This modern introduction to the Nokian Hakkapeliitta family represents future technology, and it allows for safe, economical, and high-performance driving on snow and ice in demanding Nordic winter weather. - We are proud to be able to offer more winter grip, less worry, and, in particular, more range to the ever-increasing number of electric car owners. Making transport safer and greener is also a leading principle for our product development, says Product Development Manager Jarno Ahvenlammi from Nokian Tyres. According to the EU tyre label, the rolling resistance of the new model is in class A; this has not been achieved by any winter tyre before. By using new Nokian Hakkapeliitta R2 winter tyre electric vehicle drivers can enjoy even 30% lower rolling resistance compared to other winter tyres on the market. The rolling resistance of competitors is in class C and E.
Electric cars are light, and their aerodynamics are fine-tuned. This makes them challenging for tyre designers. This new model takes the test winning Nokian Hakkapeliitta R2 and optimises all of its structural components for use on electric cars. - Our new, relentlessly tested technology concept makes the tyre body firm and stiff, and this, together with several new material components, minimises the tyre's heat generation and internal deformation. This allows for extremely low rolling resistance that is world record class. In the future, we will be using the same technology in our other winter products, explains Ahvenlammi, who leads the testing and development of Nokian Tyres' special products for electric vehicles. Rolling resistance refers to the energy required by the tyre's road contact and its deformation; reducing rolling resistance requires total control over the complex relationship between the tyre structure, tread pattern, and rubber compounds. It may come as a surprise to many that high-quality winter tyres offer even lower rolling resistance than summer tyres. The energy savings gained from the lower rolling resistance increase the vehicle's range. Maximising the unforeseen energy efficiency and safety of the new Nokian Hakkapeliitta R2 for electric and hybrid vehicles also required developing entirely new types of rubber compounds. The molecular chains of the next-generation functional Nokian Intelligent eSilica tread compound connect with the silica particles to form a strong but flexible combination. The rubber compound works very well across a wide temperature range, improving winter grip and further reducing rolling resistance. The sipes or grooves of the symmetrical tread pattern function actively regardless of the changes in grip level and temperature. The compound creates exceptional grip on ice, snow, and wet roads, and excellent wear resistance. The canola oil used in the rubber compound adds tear strength to the new Hakkapeliitta, increasing its durability, and improves grip on snow and ice. Nokian Tyres, the forerunner in the tyre industry, is known for its high-quality products, which are also safe and eco-friendly. They are carefully tailored for different markets and different demanding purposes. Over half of our product development resources are spent on testing products. - We work in close co-operation with the leading car manufacturers in order to be able to provide the best and most modern products in the industry for drivers who experience the Northern winter; electric and hybrid vehicles are no exception. Our excellent success in comparison tests is also proof of the success of our strategy. During this winter, our winter tyres have achieved over 40 test wins in car magazines, which is a record in and of itself, says Business Manager Petri Niemi from Nokian Tyres. The new Nokian Hakkapeliitta R2 is suitable for BMW's i3 electric vehicles. It will be available to consumers in January 2015 in the Nokian Tyres key markets, the Nordic countries and Russia as well as in other markets wherever true winter is experienced. The non-studded Nokian Hakkapeliitta R2 (size 215/45R20 95R XL), designed for BMW's new i8 hybrid vehicle, will be introduced in February–March 2015. The Nokian Hakkapeliitta winter tyre family from the developer of the world's first winter tyre also covers the studded Nokian Hakkapeliitta 8 and non-studded Nokian Hakkapeliitta R2 products for Tesla S electric vehicles, among other things. In Norway, for example, nearly all consumers have selected Nokian Hakkapeliittas as the winter tyres for their electric cars in order to ensure the best possible grip and driving comfort in every possible type of winter weather. Nokian Intelligent eSilica. Increased range, maximises winter grip. The rubber compound that works very well across a wide temperature range maximises the low rolling resistance and winter grip. The molecular chains of the tread compound combine with the silica particles to form an extremely strong, yet flexible combination. The sipes or grooves of the symmetrical tread pattern function actively regardless of the changes in grip level and temperature. The compound creates exceptional grip on ice, snow, and wet roads, and excellent wear resistance. The rapeseed oil used in the rubber compound adds tear strength, increasing the tyre's durability, and improves grip on snow and ice. Nokian Cryo Crystal Concept. First-class winter grip, more precise handling. Diamond-tough grip particles that have the appearance of a multi-edged crystal have been added to the rubber compound in order to improve grip on ice by grabbing onto the driving surface. Pump sipes. More wet grip. The pocket-type sipes on the tyre shoulder remove, or even pump, water out of the road surface, ensuring stable and sure grip. The increased volume of the patented pump sipes and the large number of zigzag sipes further improve grip on wet and icy surfaces. Grip claws. More grip on ice and snow. The grip claws located between the tread blocks improve grip on snow and ice, especially while braking and accelerating. Sipe activators. Better grip on ice and snow. Sipe activators located on the edges of the tread boost the functionality of the sipes under the most slippery conditions. The wider sipe activates a narrower one. Slush claws. Prevent slush-planing. To prevent slush-planing, sharp triangle-shaped slush penetrators were designed on the critical shoulder area. The slush claws on the shoulder area allow for optimal grip even in thick slush, and prevent the accumulation of slush between the tread blocks.